In a medium saucepan, combine the milk and white chocolate chips. Place over low heat and cook, stirring often until the chocolate is melted and smooth. Stir in the vanilla. Add 1 teaspoon red food coloring and then add more until your desired pink color is reached. Pour the hot chocolate into clear mugs and top with a dollop of whipped cream and sprinkle of pink sprinkles. Enjoy! For a fun flavor switch up, use full-fat or lite canned coconut milk in place of the whole milk. To make this a red velvet hot chocolate, swap the white chocolate chips for dark chocolate chips. Hey everyone! Welcome to bitter, cold January! Or well, bitter cold for me anyway, but I live in Colorado… so that’s expected. With January here and the major holidays over, I am moving on to Valentines Day! Okay, I might not be totally on to Valentines Day yet. 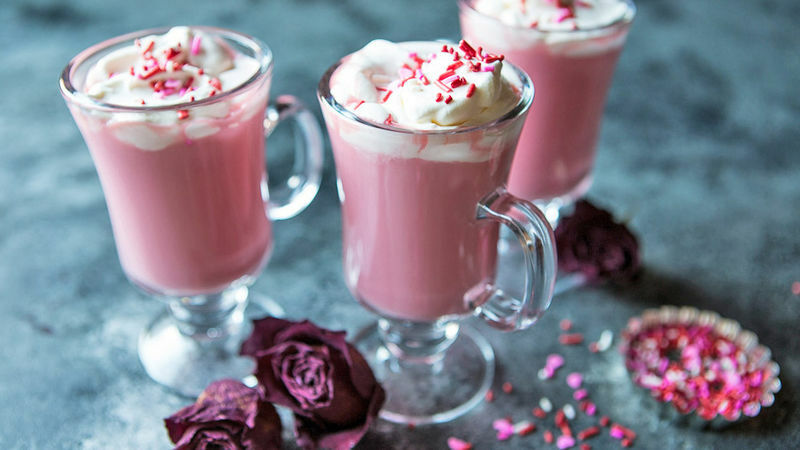 I really just wanted an excuse to make this cute pink velvet hot chocolate. What?! It’s cold outside, very colorless and honestly, I just need a fun, warm and cozy drink in my life. So pink velvet hot cocoa it is! It’s the perfect warm and romantic drink to serve now through Valentines Day. Okay, so here’s how you make it. It’s really simple. Add the milk and white chocolate chips to a pot and cook over low heat until melted and smooth. Add the vanilla and then the food coloring until your desired pink color is reached. I used around 1 teaspoon red food coloring. Pour the drink in glass mugs and top with whipped cream and pink sprinkles. Enjoy warm! And really, don’t forget the sprinkles. They just make life so much more fun. Happy hot cocoa drinking everyone!